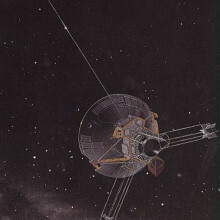 The Pioneer Anomaly sounds like some kind of thriller novel, but is actually a slight accelleration on the Pioneer probes, these are space probes launched in the 1970s and now the most distant man made objects. As they headed away from the solar system their path was carefully tracked, and a strange anomoly was discovered, they were decellerating slightly faster than they should be according to einsteinian gravity.
' alt='Pioneer 10 and Pioneer 11' >This effect was tiny, about 1 part in 10-10 ms-2 , but it was measurable, and it got lots of theoratitions very interested. This is because studies of galaxies indicate that gravity may be stronger at longer distances, so lots of theorists were creating new theories of gravity to fit the data. In 2008 a third of the anomoly was explained by Frederico Francisco and collegues, the spacecraft generates power from heat produced by radioactive decay, this heat is lost by thermal radiation, which is a form of light. Light carries momentum, so can apply a force to the spacecraft. But they hadn't managed to explain the whole anomaly. Now they think they have - a source of heat - the main electronics compartment is immediately behind the parabolic dish the spacecraft uses to communicate with earth. So thermal radiation from the electronics will reflect off the dish giving the spacecraft a slight extra decelleration, explaining very neatly the anomaly. So unfortunately for the theorists and their chances of a Nobel prize, Einstein's equations still hold. Scientists have discovered that a dose of one of the body's own stress chemical, cortisol, can neutralise a fear of heights. Scientists have discovered that a dose of one of the body's own stress chemicals can neutralise a fear of heights. Writing in PNAS, University of Basel researcher Dominique de Quervain and his colleagues recruited 40 patients with confirmed height phobia. The patients were divided an intervention group and a control group. Over several days, both groups were then subjected to a series of three graded height exposure therapies using a virtual reality headset to fool the wearer into believing he or she was traversing a series of above-ground walkways and platforms. While this was happening, the subjects were also asked to rate their subjective levels of discomfort, and skin conductance measurements, another measure of stress, were collected from some of the participants. The subjects paused at each "station" along the way until their self-reported stress levels fell. Critically, prior to each of these three treatment sessions, the members of the intervention group also received a small oral dose of the chemical cortisol, one of the body's own stress hormones produced by the adrenal gland. Following the treatment sessions, all of the subjects were then followed up with two assessments 3 days and 28 days later at which their levels of height phobia were reassessed. The subjects all benefited from the exposure therapy, with the controls showing about a 30% reduction in fear responses during the later assessments. But amongst the cortisol-treated group, fear had fallen by over 60%. The reason for this, the researchers argue, is that cortisol causes impaired recall of established memories whilst simultaneously strengthening the formation of new ones. So by exposing the acrophobics to a stressful virtual height situation and permitting them to get used to the sensation at each stage, in the presence of cortisol, the subjects recalled fewer of their fear memories and re-wrote stronger imprints of the experience being less stressful, causing their fear responses to be "extinguished". The team also point out that the method might be generalisable to other anxiety states too. 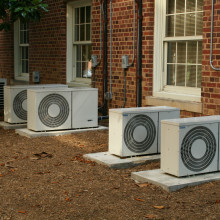 Even in the UK air conditioning is becoming more and more popular, and in parts of the world with a less temperate climate it is a huge use of energy, along with other forms of cooling for fridges and server farms adds up to a huge amount of power use. At the same time a large amount of potential work is wasted from low grade heat from industrial processes, and for that matter the sun is being wasted. One way of taking advantage of this is an adsorption chiller. These work by having 2 chambers covered with silica gel which attracts water molecules onto its surface a bit like a sponge, so dries out the air. One of these is opened to whatever you want to cool which is covered with water. The water evaporates in one place cooling it, and then condenses on the silica gel allowing more water to evaporate. Eventually the gel becomes saturated, at which point you use the other chamber to adsorb the water. Meanwhile the original chamber is heater to 70-80°C drying it out, and the water is recondensed on a cooler surface and recycled. These can cool water or air down to about 4°C using a tiny fraction of the electricity of a conventional cooler, but they are normally at least 4-5 time larger so are often impractical or uneconomic to use widely. Peter McGrail and his team are working on replacing the critical silica gel, they are constructing materials made up of metals in organic molecules which can be engineered to self assemble into very open structures with a huge surface area, should mean that the material can absorb 3-4 times more water than the silica gel weight for weight. Plus the strength of the water molecule binding to t the surface can be tuned. Allowing them to optimise this to the temperature of the waste heat you are using and how cold you want to cool to making the process much more efficient. This opens up the possibility of cooling computer server farms with waste heat from a power station, or even having air conditioning powered by the heat of the sun. A tissue dye, called ThT and used commonly in pathology labs to stain proteins, appears also to have significant life-lengthening effects in some species. A tissue dye, used commonly in pathology labs to stain proteins, appears also to have significant life-lengthening effects in some species. Known as ThT - short for Thioflavin T - the tissue stain is usually employed to reveal the extent of beta amyloid build-up in brain samples from patients with Alzheimer's disease. But its ability to bind to these pathological proteins made Buck Institute scientist Gordon Lithgow and his colleagues wonder whether the dye might also be able to block the formation of abnormal protein aggregates in the first place. 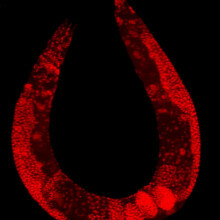 To find out, they treated groups of C. elegans, tiny worms used a model organism in genetic studies, with low doses of the dye. Incredibly, the animals extended their lifespans by up to 80%. "They looked younger and moved around more," says Lithgow. To home in on the underlying cause for the longevity boost, the team then tried dosing worms that had been genetically programmed to develop a muscle wasting condition caused by an amyloid build-up similar to the situation that provokes Alzheimer's in humans. 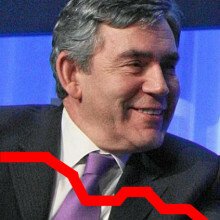 Compared with their controls, the proportion paralysed worms fell to 20%. The team then used a genetic technique to suppress the action of a range of different classes of genes in the worms, looking for genes that appeared to be essential for the life-prolonging effect of the ThT. Several critical candidates emerged, and foremost among them were genes concerned with the so-called "stress-response". This helps cells to defend themselves against damage, partly by stabilising their proteins, including the very proteins that tangle-up to form amyloid plaques. This, say the researchers in their paper in the journal Nature, suggests that ThT can prolong life by initiating stress-response pathways in cells, stabilising misfolded proteins to prevent tangles from worsening, and also by binding directly to amyloid aggregates to promote proper folding and block pathogenic effects. Charles - This dish is 25 meters in diameter and it's fully steerable, which means that we can scan it in both elevation and azimuth to track storms or clouds as required by the researchers who come to use the facility. Sue - How easy is it to actually steer? You say fully steerable, but I can't imagine how you would actually begin to steer something of this magnitude and height. Charles - It is a big structure; it was originally designed for radio astronomy. We don't use it for that purpose right now, we're using it for meteorological research. We have our radar scientist who is just about to start it up for us, using computer control in the control room, and you'll be able to hear the system operating. 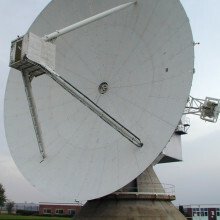 Charles - That's the klaxon to warn anybody outside that the dish is about to start moving. We're now doing an azimuth scan, so it's at a fixed angle of elevation and is going to rotate through 360 degrees. Charles - That was the breaks letting go. The breaks let go, but now, it is actually very quiet. We've recently had the servo system upgraded. Before that, it sounded a lot more impressive, a lot more noisy! But now it's very quiet, very smooth. Sue - This enormous dish has now turned through 90 degrees in a very short period of time. Charles - It does actually rotate at 1 degree per second, so a 360-degree scan will take you 6 minutes. Charles - Yes, the antenna is a very large structure. There is a multi-parameter 3 Gigahertz radar on the dish, and with that radar we are able to characterise in great detail the structure of storms: Precipitation, convective storms. With that radar, we have a 0.25 degree beam, and that's a very narrow pencil beam which means we can move it around within the convective storms and look at the structure going on within those storms. Sue - So you're bouncing radio waves off of clouds, like the clouds we can see above us today? Charles - Yes, we're transmitting pulses of radio wave energy with a wavelength of about 10 centimetres. The pulses go out into the sky where they encounter targets, and a small amount of power gets reflected back. We then analyse that power when it returns to us so we can establish particle size, type, phase (i.e. ice or liquid water) etc within storms and clouds. Sue - And you've also got a smaller dish only a meter or two across; how many other dishes do you have around the site? Charles - That's a 35 Gigahertz radar designed specifically for looking at cloud structures. We use higher frequencies for clouds because the particles within clouds are smaller, and therefore you need a shorter wavelength to detect them effectively. In terms of dishes on the site, I think we probably have three of that type. Sue - What about behind it, because when I arrived there was an even smaller dish and what looked like a plastic owl? Charles - Yes, indeed that is a plastic owl! We have a multi-frequency microwave radiometer which we use for measuring water vapour profiles in the atmosphere and the liquid water content of cloud. You mentioned the plastic owl- that does a very good job of protecting the instrument from the attack of birds in the vicinity! Albert - The first thing that happens is that your speech or speech signal is translated or converted into an electrical signal inside of your mobile phone, which is then digitised and reconverted into a long string of zeros and ones. These are again remapped into a different type of signal, which is suitable for transmission from your mobile phone antenna. This signal then arrives to the nearest base station which then puts you through the next level in the phone network and eventually connects you to the office. Meera - So you say, whilst someone's out on the move, their environment is constantly changing. How is the signal changing? Albert - When we move, the signal that either we or the base station transmits bounces on buildings, cars, other users, trees, and we have no way of knowing what the signal is going to be. Sometimes, these multiple paths or multiple signals, or multiple bounces of the signal will add constructively so we will have a very good reception. Other times, these components will add destructively. The mobile phone periodically trains itself to learn what the channel characteristics were then using that information, it can reliably recover the data. Often what happens as well is that information is transmitted in different frequencies and if one of the frequencies is down for whatever reason, then information can still be restored from the remaining frequencies. Albert - Yes, that is right. What the mobile phone does is add another building block called error correction and it does it in such a way that even in the presence of errors, or even in the presence of destructive interference or fading from the channel, we can still recover our data reliably. So for example, one simple way one could think about this is to repeat the original compressed bit stream twice or three times. This clearly adds redundancy, it would make transmission more reliable, but the data rate will suffer significantly. Instead, what all communication systems use are error correction codes that are mathematically more sophisticated than this simple repetition code. One primary example of that is what is used in CDs where a code called the Reed-Solomon code is employed. Meera - We've now come down to one of the engineering workshops where Dr. Yossi Sayir is busy drilling holes into a CD. Now Yossi, this does actually relate to what we've been talking about with mobiles. Why are you drilling holes into these CDs? Yossi - So I'm trying to illustrate on the CD, how error control coding works. We've drilled some holes at the beginning of the first track of this CD. The CD uses an error correction mechanism which should be able to hopefully play the sound despite the fact that we've drilled holes in it, so it should be able to overcome the channel disturbance that we introduced. Dave - They've put this in there, so even if you scratch your CD, it's not completely worthless. Yossi - That's the idea, right. Yossi - So I'm going to put it in now, press the play button, and hopefully it will work. Meera - That hole was pretty much towards the beginning of the track and as we heard there, it was still playing very smoothly. Yossi - Basically, what's happening here is we've added structure to the data. I think the best way to think about it is to think about Sudoku puzzles. The information would've been encoded into the CD as a full Sudoku puzzle. By drilling holes or scratching the CD, we're erasing some of the information, which is very similar to what's happening in mobile phones where the wireless channel is doing that for us. The task of the reader or the receiver in the case of wireless communication would be to fill-in those gaps and try to guess their missing numbers. Meera - Now moving back to you Albert then, what about the different types of signal, so 1G, 2G, GSM, how do these differ? How does error correction differ, or the handling of these holes differ, with these different types of signals? 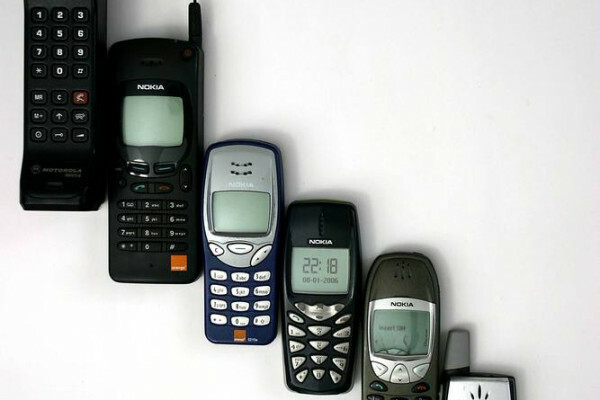 Albert - So the major change occurred when GSM or 2G was introduced because GSM was the first all-digital wireless communication system which featured error correction and data compression, while 1G was an analogue communication system. Future generations including 3G, 4G, 5G, the main aim will be to progressively adapt to the channel characteristics and allow to transmit higher and higher data rates. In order to help us achieve this goal, future systems will also feature multiple antennas at a transmitter or at a receiver which will help us increase reliability and data rate. Dave - That was Dr. Albert Guillen and before him, Yossi Sayir, both from the Engineering Department at the University of Cambridge. Dave - As the demand for mobile communication devices increases, we're demanding progressively faster data transmission rates. One option to improve this is to install multiple antennae into the device so there's lots of streams of data can be handled in parallel, but this comes at a cost in size, or does it? Scientists at Bristol University have come up with a way to share the antennae of nearby devices to get around this problem. To explain how this works, one of the inventors, Professor Mark Beach, is with us. Now Mark, should we start off really simple? What limits the amount of data which two straight aerials can transmit between one another? Mark - Well, we are very limited by the channel bandwidth that we can provide to mobile communication systems. So the bandwidth is the main driver, followed by the amount of power that we allocate to the transmitted signal which we can increase to improve the data communications. But that causes interference with other users, and we then reduce the capacity of the system. Dave - So the bandwidth, this is the effect that if you send data on a radio frequency, the more data you send, the more frequencies around the original one it uses. Mark - Yes, that's right. As we expand the data rates, we get a corresponding increase in the bandwidth of the signal needed to transmit information between A and B.
Dave - I guess there's a limited number of frequencies out there that I can use, so there's a limit to the number of people who can talk at the same time or surf the internet at the same time. Mark - Yes, it's true. The frequencies around 1 to 2 Gigahertz are the sweet spot for mobile communications where the signal propagates well with less attenuation, and the physical size of the antennas used allows us to put them into mobile devices. Dave - I guess the whole of this problem is a bit like having lots of people talking in a room. One person on one side of the room is attempting to listen to someone on the other side of the room but filter out all the other people talking at the same time. 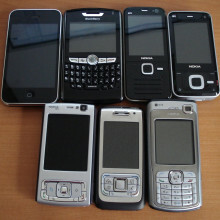 Like all these different mobile phones. So, one technique is to talk at different pitches. So you might be able to hear a high pitch at the other side of the room if everyone else is speaking at a low pitch. But you're using a slightly different approach. What are you actually doing? Mark - What we've been looking at is the use of multiple antennas to increase the transmission bandwidth of information by exploiting the multipath in the channels that we heard about a few minutes ago. So the multiple antennas excite the multipath and at the receiving end we can separate out the multipath's signals. We resolve these individual spatial channels that we can push information down in parallel. We can do this on the same frequency and at the same time. Dave - I guess this multipath is like standing next to a big reflective building. The mobile phone message can get between your phone and the mast in two ways. It can either go straight there or reflect off the building. As you get a very complicated system there's lots and lots of different reflections and so you somehow take advantage of this. Mark - Yes, we are taking advantage of the multipath's signature in the channel and when we have multiple antennas, we will actually see slightly different signatures, and those signatures can be quite unique, and we can use those special paths independently to support communications. Dave - Does this mean that if you've got lots of different aerials in one place, you can actually build a directional aerial - you can put them together in one way so you can just listen to the reflection from the building, and you can add the reception from your aerials together in a different way to listen to the direct signal from the mobile mask, so doubling your data rate? Mark - It's along those lines. We can actually beam from the information from these spatial paths and extract them at the receiver. The theory tells us that if we doubled our number of antennas, we can double the data rates, and if we got up to four times the number of antennas, we'll have four times the rate, providing there is sufficient multipath richness in the channel. 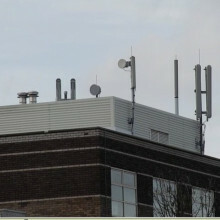 There is eventually a trade-off with the number of antennas and the actual benefits that you will see. Dave - Can you just carry on adding more and more antenna into something the size of a mobile phone with no problems at all? Mark - Well there is a problem. Although I mentioned that the frequencies around 2 Gigahertz make quite small antennas, there's a limited amount of real estate in a mobile phone where you can actually place these devices because of the other electronics inside the box. In particular, the display on Smartphones. So we are somewhat limited to between probably two and four antennas. It is probably about the limit that you could actually put in a portable device. Dave - So what are you doing to get around this problem? Mark - Right. What we've been looking at is sharing antennas. If there was somebody else's mobile phone which was enabled with multiple antennas, and if they were not using it in conversation, we could share those antennas and use them to form our communications link. This would make the two phones slightly simpler in terms of the number of active antennas that they would need. Dave - So you'd be essentially joining the two mobile phones together with, instead of the wire, another wireless link which is very short range. Mark - That's right, so we would form a virtual MIMO system between the two devices and then have a short range low power link between the actual users. Dave - I hear you've been using this in practice. How has it been working? Mark - We've been looking at this using quite a sophisticated channel sounder that measures the multipath signatures of the channel. We could see if we separate the antennas and have two with one user and another two antennas with another user, does that actually form a good 4 X 4 MIMO system? Dave - Were you getting an increase in speed on average? Mark - On average, yes. One of the things about MIMO communications is that you require this independent fading so we can get these separate spatial channels. So moving the antennas further apart normally gives you much better characteristics. We found from real measurements done in the city of Bristol that for at least half the locations we chose, that was certainly the case. Dave - Brilliant! Thank you very much, Mark. 38:30 - What happens to the signal if you fly past base stations quickly? Chris - It wouldn't really matter from a radio point of view because radio is moving at the speed of light which is considerably faster than 500 miles an hour. It's whether the network could actually keep up with the very rapid transition between the different cells. Chris - With mobile communications playing an increasingly major part in our lives, many people are worried, quite justifiably, about the potential health impacts of this technology. For this reason, a large study called COSMOS has been set up to track the ongoing health of 250,000 mobile phone users over a 30-year period. The leader of the study is Professor Paul Elliott. He's from Imperial College in London and he's with us today. Hello, Paul. Chris - Every good study has got to have a fantastic acronym to represent it, COSMOS being no exception. What does it stand for? Paul - It's a COhort Study on MObile phoneS in health, and the key there is the 'cohort' which means, as you say, a prospective study over many years following the health of people in relation to their mobile phone usage. Chris - It sounds fairly trivial, but I'm sure it's not, to recruit a huge number of people and then try to get data from them, so how have you gone about this? Who were the study subjects and how are you following them? Paul - We identified people through mobile phone companies who sent out a large number of letters to subscribers, and the idea was to get people at different levels of usage - low, medium, and high, so that we can get a broad range of use. All these letters went out to subscribers in the UK and then we invited people who received those letters to log in to our website, answer the questionnaire, and give consent to take part in the study. Chris - How often are you following the people up? Paul - They give consent to us getting copies of their usage of mobile phones through the operators every year. So we get three months usage every year, and then the idea is to get back to them on regular intervals with questionnaires. Regular being over a 4-year period so we plan to go back to them with a questionnaire. Chris - What about keeping in touch with them? One problem that big longitudinal studies like yours often face is people who get lost to follow up for various reasons. So, how are you going to make sure you keep people in the loop? Paul - Clearly working on mobile phones is good. We can track their phone either directly through the participant or through the mobile phone operators. The participants also give consent for us to track their health through routine registries such as the cancer registry, the mortality register, and also hospital admission registers. So we can track people and their health even if we can't find the people themselves. Chris - It's quite neat that you can get access to how often they spend on the phone which enables you to establish the dose that they're getting, because obviously when one is looking for causation there's got to be a dose dependent relationship, hasn't there? The more you use something, the more of an outcome we should see. Paul - Exactly. The key is to get exposure variation, as you say. The proxy for this will be how often people use the phone, and by stratifying the cohort of outset into low, medium, and high users, we've actually got a very good distribution of usage at baseline. Then we need to follow up, through continually looking at the mobile phone records, how much people are using. Then we look for a dose effect in terms of potential health outcomes. 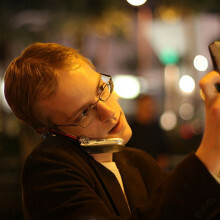 Chris - One possible confounder here could be that not everyone uses their phone with it glued to their head. Some people use their phone with it on the table in front of them and they're reading some texts or a Twitter feed. Can you discriminate between active calls where someone is dosing their brain with radiation at very close measures and more distant operations like that? Paul - Yes. We can differentiate between data use, SMS, and active phone use. But of course even with active phone use some people will use a hands-free device which will reduce the exposure to the head. So we do ask about use of hands-free devices as well. Chris - What about children though? One thing I've heard people say a lot is that as children are growing up their bones are less dense, therefore their skull is less dense, therefore the attenuation of any microwaves coming out of the phone going into the brain will be lower in a child. So their relative dose to potentially sensitive tissue inside could be higher. Have you got them represented in your cohort too? Paul - No. Our study is a study of adults, but you raise an important question. Clearly children are exposed. From what you said earlier in your programme it sounds like children have more phones that they have books! So this is clearly an issue and it is a question for active research. Does use in children affect, for example, their concentration, their sleep? And this is something that, for example, the WHO has called for research on because children are currently under researched. Chris - It sounds like the study has been well put together and you're going to follow these people up, and we're going to see if there are any health outcomes. What do we already know about the risks? Are there any preliminary data to suggest that there might be an effect? In other words, what do you think might come up? If there is an effect, what are you expecting to see? Paul - There have been a number of so-called 'case-control' studies. These are a different design where you find cases of a disease, in particular people looked at different forms of brain cancer, and then a set of control participants who don't have the disease, and ask about their use of mobile phones going backward in time. So this is based on subjective reporting. Those studies have been reassuring up to about 10 years of usage. So that's good news, but what we don't know about is longer term use. That's where the COSMOS study will be very important because we'll be able to follow people up over many years of usage. Chris - Indeed. It takes 50-60 years of dedicated subscription to cigarettes and the smoking habit to get lung cancer. So it may be that just looking in the near term, which many of these studies have, is just too short for us to see enough dose for a small or marginal increase in, say, brain cancer rates, if there is a risk of that. Paul - That's absolutely correct. Chris - So, where do you see this playing out to now? Are you going to stick to this cohort or are you going to build in additional people who will come along behind this initial group in order to address some of the other questions that you've raised with us today? Paul - The cohort is a multinational study, so the UK is one component and we have colleagues also working with us in various other countries: Denmark, Sweden, Finland, and the Netherlands. The idea is, as you say, to get to a cohort of around 250,000 people. The study is open to other countries to take part in as long as they can follow the protocol. I think that clearly the larger the study the more power it will have to detect what might be quite small effects, if there is indeed any effect of long term mobile phone use on health. Chris - Paul, thank you very much. 46:05 - Can mobile phones really lead to diseases? Can mobile phones really lead to diseases? We put this question to Professor Paul Elliott from Imperial College in London..
Paul - We don't have a biological mechanism to explain why mobile phones might cause cancer. If you like, the study is taking a long term view because we don't have a mechanism. As well as looking at cancers, we'll be looking at other neurological degenerative diseases such as motor neuron disease, Alzheimer's disease, Parkinson's disease, and cerebrovascular disease. 47:00 - Why does my reception drop out? Why does my reception drop out? We put this question to Professor Mark Beach, Bristol University... Mark - In terms of the signal dropping on the mobile phone from 4-bars to 0-bars, you've got to remember that things are moving in the environment around you, so it may have been a bus or a train that blocked the signal to your mobile phone from the cell site and caused your call to drop out. In terms of indoor coverage, yes, that can be very patchy. There can be metal objects around the house that block the signal. Gaining height by going upstairs is often the solution. Of course, we could raise the power of the base station sites. There is certainly a reluctance to do that, maybe on health grounds. We haven't got any definitive evidence one way or the other there. But also, just in terms of green issues associated with mobile phone technology, we're doing everything we can to make the system operate at very low power. 48:24 - Are mobile phone base stations damaging to health? We put this question to Professor Paul Elliott from Imperial College in London... Paul - Absolutely, those people are not going to be in our study. But we have actually carried out a large national study in England and Wales looking at mobile phone mast emissions, proximity to masts, and childhood cancers. We found no association whatsoever between the mast and the cancers. Of course, the exposures that people receive from the mast are orders of magnitude lower than they get from putting a phone to their head. 49:16 - Why don't we use the emergency channel for calls? Why don't we use the emergency channel for calls? Mark - In a mobile phone network we have what we call broadcast control channels, and the traffic channels that the general communications go out on. The broadcast control channels can also carry the emergency calls and your SMS messages. So yes, it does happen that sometimes you've only got emergency cover and not general call cover. 49:53 - Can mobile phones kept in the pocket cause testicular cancer? Paul - This isn't something that is easy to study. There isn't really any evidence to suggest that mobile phones have an effect on fertility, but it is an open question and it's certainly something for example that the WHO (World Health Organization) are interested in. We don't really have a lot of data on that in our study because the exposure assessment is relying on the use of the phone and when it's being used rather when it's sitting quiet. Of course, exposure is much less when you're not actually speaking; it's just hand-shaking to the mobile phone base station. 50:52 - How does a text message get to the other phone? How does a text message get to the other phone? Mark - The characters that you type into the phone get sent as a data message back to the cell site and attached to that is the mobile phone number of the person you wish to send it to, so that's routed through the network and the message is dispatched to that phone. Dave - I heard somewhere that text messages were just put into a bit of spare space which they have in the way that they designed their system, and that was put in as an afterthought very, very late on design. Mark - It wasn't actually putting it as an afterthought. The original concept behind the short message service was to help the engineers who were effectively rolling out the network, putting the base stations up and adjusting all the parameters that make the network tick. So this is a way for them to report back how well it was working and they suddenly repurposed that for the commercial service that we have today for texting. 51:56 - What constitutes heavy mobile phone use? What constitutes heavy mobile phone use? Paul - We ask the mobile phone companies to stratify on their own data that they have and of course this is commercial data. But we have published some data from initial pilot studies that had a distribution of usage from very low, less than 5 minutes, to more than 6 hours a week. So we have a spread right across that range. 52:39 - Do modern mobile phones put out a weaker signal? Do modern mobile phones put out a weaker signal? Mark - Yes. The transmit power of the mobile devices is actually dropping. Although you may think your battery life is quite poor these days if you've got a smartphone, it's not to do with the RF energy coming off the phone. 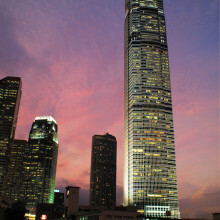 It's more to do with the display technology and the fancy things to do with the applications. So transmit power is going down and as I said earlier, we need to get it down in case there are any concerns on the health side, but also conserving energy and being more green.s that range. 54:01 - Why do speakers make an odd noise when near a ringing phone? Why do speakers make an odd noise when near a ringing phone? Dave - The phone is sending out a signal to all the nearby base stations, essentially telling them where it is, and I think possibly also to allow the base station to characterise what direction it should send the the signal in, and all sorts of other things like that. It does it just as it picks up a signal and also does it randomly during the day so that the base station knows where it is. Chris - So you get an induced current in the speaker wire and off it goes! 54:37 - What is the most efficient way to heat water? What is the most efficient way to heat water? Should we just head up what we need as and when we need it, or leave a reservoir of warm water ready to go? Hugh - This is a very interesting and topical question. If the hot water is stored in a perfectly insulated tank, then it makes no difference whether the water is heated one hour before it's needed or one day before, or even one year before. There's nothing at all to be gained from heating the water up 22 hours in advance, but that requires that the insulation is perfect. In reality, insulation is not perfect and the water heater will lose some heat in advance and this heat cannot be recovered. It's the same as when we're boiling water for a cup of tea. If we boil the water when we need it, that makes sense because the kettle is not that well-insulated. If you boil the water an hour in advance, the water would be cold when we needed it. How much energy wastage are we talking about? 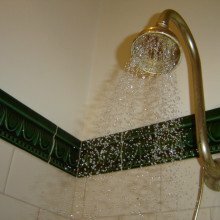 Suppose a 5-minute shower uses 60 litres of water, which is about right; and suppose the water is delivered at about 40 degrees, which is about right; and in the winter the water is cold, somewhere around 0, which is about right. So we're talking about 4 kilojoules/degree/litre of water. Now suppose the tank loses 10% of its heat in 24 hours. Well then that's a loss of getting up to 1 Mega Joule of heat. That's equivalent to running an electric kettle for 6 minutes, enough to boil the water for several cups of tea. So if you're the kind of person who's bothered not to over-fill the kettle when making a cup of tea then you should certainly follow our Croatian friend's example and only heat the shower water when it's needed.